Hosts: Patricio Gargollo, M.D., and Walid Farhat, M.D. Patricio Gargollo, M.D., and Walid Farhat, M.D., discussed Positioning, Access, Trocar Placement, and Expert Tips for Success in Minimally Invasive Surgery in Pediatrics. The format webinar began with a detailed review of the challenges, controversies, and nuances of minimal access surgery, along with a set of important technical tips. Dr. Gargollo followed up with a broad range of treatment options and tips. some common sense, many medical. There was a lively discussion from the international participoants attending the session. 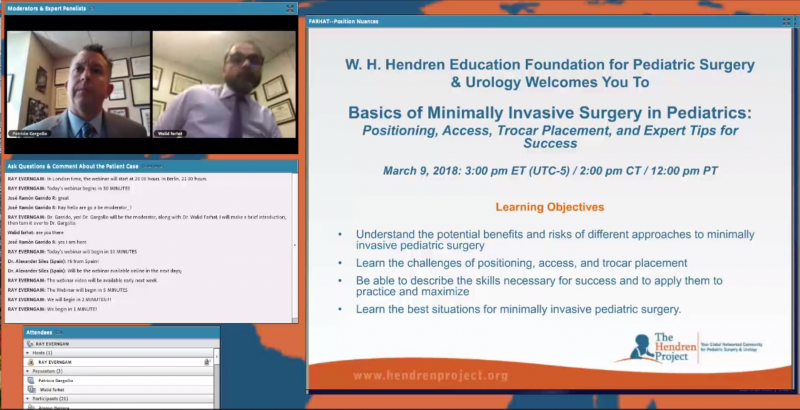 The live webinar allowed interactive exchanges between participants and expert panelists as they address fundamentals of basic techniques and basic strategies in minimally invasive surgery. However, the discussion can continiue using the comment form below. This THP Webinar was presented on 9 March 2018.